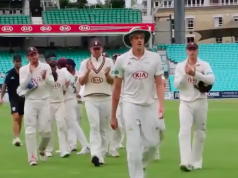 Second-top plays second-bottom at Chester-le-Street in a match that Somerset desperately need to win in order to revive their flagging fortunes. After Dave Nosworthy left the club and was replaced by Matthew Maynard, there was optimism and hope that perhaps they could push on from their near-misses in recent years and claim the county’s first ever County Championship title. However, that is almost certainly impossible this year, and the signs appear to suggest that the title is further from Somerset’s grasp than ever. Instead, they find themselves embroiled in a relegation battle and it is far from certain they will win. The losses of Steve Kirby, Craig Kieswetter, Jos Buttler and Nick Compton in recent years have damaged the side badly, and the new signings are still finding their way at the club. Jim Allenby scored a vital 64 in Somerset’s only Championship win so far at Trent Bridge, and Tim Groenewald took 4-41 in the second innings of that game to secure the points. Tom Cooper’s 99 against Yorkshire at Taunton was encouraging, but his run of low scores (he has reached double-figures in just three of his last seven innings) must be a concern both for himself and for the club. Durham are once again proving that they can become more than the sum of their parts in order to compete successfully in the County Championship. The late-career flourishing of captain Paul Collingwood has been an incredible boost for the northern county with both bat and ball: he tops their batting averages and is behind only Rushworth and Wood in their bowling averages. While Scott Borthwick appears to be a fading light in England’s spinner debate, his batting is still a huge asset and will play a key role in Durham’s title chase. With a batting average of 61.57 and a bowling average of 22.2, there is little wonder why Paul Collingwood is a clear choice as Durham’s key man. His experience and wisdom are of immense benefit in the dressing room, and his on-field contributions have been no less important for his side in 2015. He is constantly the subject of retirement speculation: every season is touted as his last. He has been linked with various coaching positions, and has worked with Scotland and the UAE in the past: however, retirement should be the furthest thing from his mind given his present form. With his batting average nearly double that of any other Somerset batsman, James Hildreth is another obvious key player in this encounter. A top contender for the title of greatest modern batsman never to play for England, he has demonstrated his skill and determination again this season, contributing a massive 23% of the runs scored off the bat by Somerset in 2015. The troubling form of Ian Bell in international cricket might just provide an opening for Hildreth to make an unlikely Test appearance, but Somerset will hope they can cling onto their star player for the time being. Neither Ben Stokes nor Mark Wood is available for Durham due to England commitments, but the Durham squad is unchanged from the side that defeated Worcestershire. Chris Rushworth is fully recovered from a minor back problem as well. 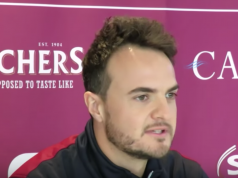 Somerset have left out Pakistani spinner Abdur Rehman again because a green seamer is expected in Durham, and veteran Alfonso Thomas is rested. 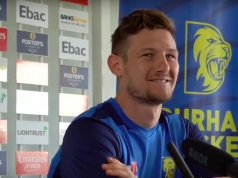 They have not been affected by international call-ups this time around despite Lewis Gregory being in the England ODI squad that travelled to Ireland. Otherwise, they name a full-strength squad. Somerset squad: Marcus Trescothick (c), Tom Abell, Jim Allenby, Alex Barrow (wk), Tom Cooper, James Hildreth, Lewis Gregory, Tim Groenewald, Johann Myburgh, Craig Overton, Jamie Overton, Peter Trego. Durham squad: Paul Collingwood (c), Usman Arshad, Scott Borthwick, Paul Coughlin, John Hastings, Keaton Jennings, Calum MacLeod, Gordon Muchall, Graham Onions, Ryan Pringle, Michael Richardson (wk), Chris Rushworth, Mark Stoneman. Temperatures could climb as high as 18 degrees at Chester-le-Street on day four of this game. Rain is unlikely to affect proceedings, although clouds could assist swig after the first day. Chester-le-Street is famous for producing more results than draws, and this game should be no different.